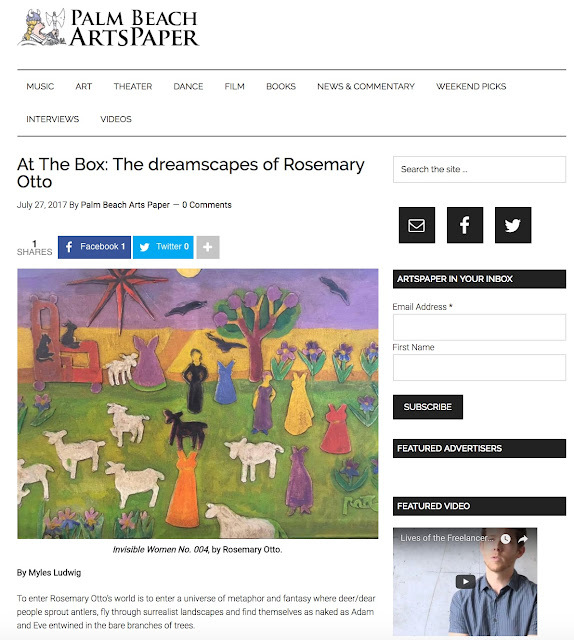 Box Gallery: Rosemary Otto Exhibition at The Box Gallery: Review in Palm Beach ArtsPaper Today! Rosemary Otto Exhibition at The Box Gallery: Review in Palm Beach ArtsPaper Today! Rosemary Otto: The Invisible Women is on display at the Box Gallery, 811 Belvedere Road, through Aug. 30. For more information, call 786-521-1199. More of Otto’s work can be found online here. Rosemary Otto recently met up with Jana Panarites and Curator, Rolando Chang Barrero at her cozy and welcoming home in Lake Worth to discuss her life and her art-especially her newest series of painting "The Invisible Women."